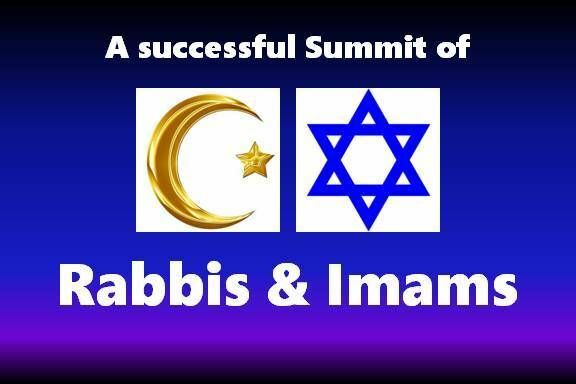 December 11, 2016, Washington, DC — The 3rd Annual Summit of Rabbis and Imams was held today at Tifereth Israel Congregation in Washington, DC. The theme of the summit was standing up for each other and building enduring relationships to contribute towards the cohesiveness of America, an America where no one has to live in apprehension or fear of the other. Story after story was shared. A seven year old boy asks his father on the next morning after the elections, “Dad, are we going to be kicked out of America now?” Another six year old girl asks the same question to her father and follows it up with, is any one in our family going to be deported?” A woman with a stroller and the baby was stopped by a guy driving the truck, who did not want her to cross the road. Swastikas were painted on some Jewish homes and synagogues and anti-Jewish statements have been made. A dramatic rise in Anti-Semitism /Islamophobia in particular and other phobias in general have caused a great deal of concern. Collectively, mistakes have been made over the years, we have talked extensively about the issues facing Women, African Americans, Jews, LGBT, Muslims, Mexicans and all others except one group, the unemployed/ underemployed rural white Americans who were affected equally like all others. Hillary Clinton did not extend a ‘specific’ hand of friendship towards them, had she done that, the story would have been different. This neglect has caused a severe damage to the social fabric of our nation; everyone is apprehensive and has lost trust in each other to function effectively. At least from here on we must include everyone in the dialogue, and as an individual my efforts would be directed towards reaching the disaffected ones. We cannot exclude anyone from our conversations. Our first priority ought to be making peace with those who are perceived to be polarized; without them, we remain polarized. 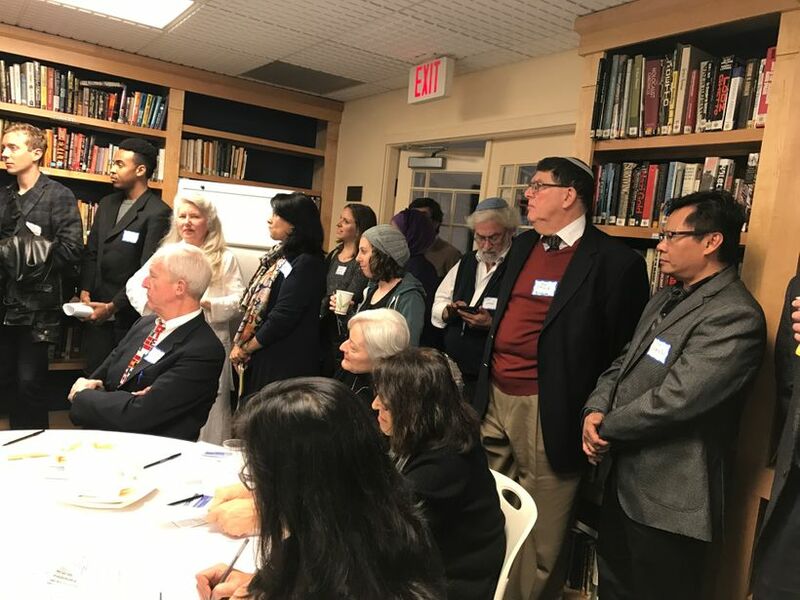 The first part of the summit was organized as round table talks – A Rabbi, Muslim and others were seated alternately around the table with a given set of questions to identify the problems and offer solutions over the fabulous lunch. If Muslims were to run into a dire situation, most Americans will stand up for Muslims out of a sense of fairness and justice, and we know darn well that Muslims will reciprocate it wholeheartedly out of a sense of gratitude and inherent caring for fellow beings. Jonathan Greenblatt, director of the Anti-Defamation League (ADL), which campaigns against anti-Semitism and other bigotry, said he would register as Muslim if the database is created because of “painful memories” from when Jews were “identified, registered and tagged”. That sentiment was echoed by virtually every Rabbi and laity present in the sanctuary. My roaring thoughts were, how do we get this message to the world around us? 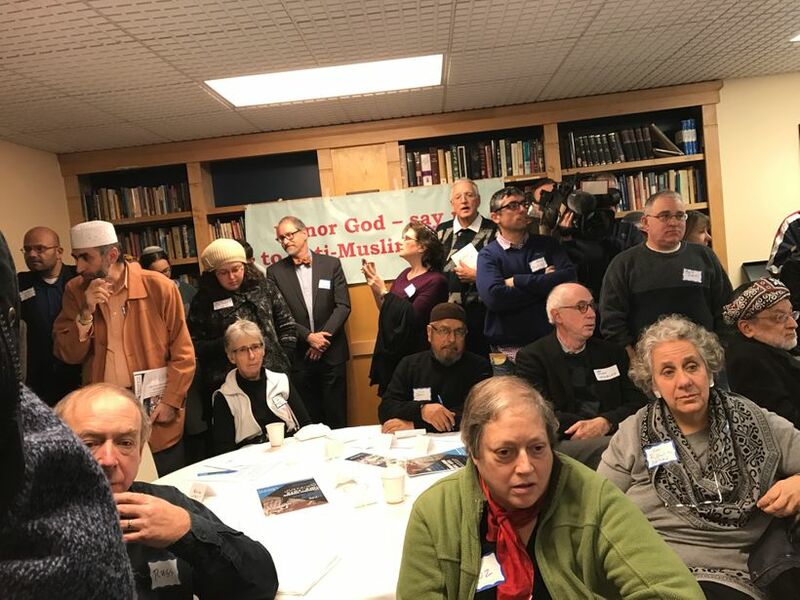 As an American and a Muslim committed to building a cohesive America, where no American feels excluded or alienated, this event was uplifting and this good news must reach all Americans. Unless we stand up for each other, the world would not be a better place to live. America’s greatness lies in the spirit of standing up for each other. My peace hinges on peace of people around me no matter who they are, my security depends on the security of people around me no matter what political, religious or social affiliation they espouse. Here is another great opportunity for Muslims and Jews to come together to strengthen the bonds. Our issues are not Muslim, Jewish, Christian, Hindu, Sikh, Bahá’í or the other. They are American issues as they affect us all in functioning effectively, and together as Americans we have to find solutions. No American has to live with the feeling of alienation or apprehension or fear of the other. We are all in this together and stand with fellow Americans for the common good of every American. No good is sustainable unless it is good for all. Imbalance or injustice leads to more of it.